XKLradio is the moment you will hear, your favorite song but also, a unfamiliar song off the album, or the unsung artists that’s not on mainstream radio, but has a xklusive sound and its own fan base. XKLradio is a music/talk hybrid playing the latest, hottest, xklusive music in hip-hop, R&B, top 40 etc, with xklusive news, conversation, and guest. XKLradio is also an opportunity for underground/ local artists to be heard and have records broken, hosted by DJ PAT Xklusive. This episode of XKLRADIO features Chicago Streets Hip Hop Legend “Parkay” teeling us his comeback story, from being shot 6 times 2 yrs ago, and now back with New Music, also featuring Bump J. Also, we talk to ExEll who breaks new single “Money Problems” and Bruus, young Artist and producer working with Parkay and Bump J. Follow these artists @parkay @ExELL @Bruus via Instagram, Twitter, and find their music via itunes, Spotify, Spinrilla, and more. This episode features Chitunda Tillman, discussing how he wrote the original script for the hit movie “John Q”, and how hollywood stole his story, discrediting Tillman, also how his book explains his entire Lawsuit journey with Hollywood until this day, and more. Check out Tillman’s full story at TheRealJohnQ.com. This episode of XKLRadio features “DJ Luna” from Every Blue Moon (EBM) Wale’s new company. DJ Luna talks about connecting with Wale, being fresh to Djing and more, Hosted by DJ Pat XKLusive. 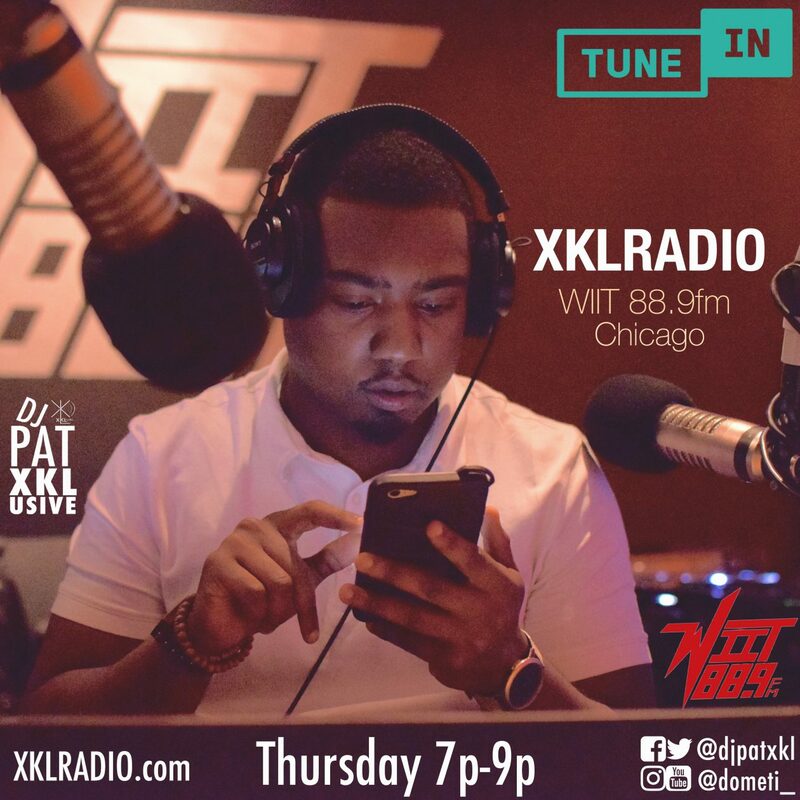 This episode of XKLRadio features Violinist “Windy Indy” and Rising Chicago Rapper “BBandz” stop through talk about touring, new music and more, hosted by DJ PAT XKLusive and Dometi The Prophecy on XKLRadio WIIT 88.9fm Chicago. This episode of XKLRadio features Hip Hop Legend Roxanne Shante, talking about her career, new bio pic coming this Summer, being a young mother, thoughts on Sheather, and more. Follow @imroxanneshante via Instagram/Twitter. This Episode of XKLRADIO features Female MC “K’Valentine”. Follow @itskvalentine Twitter/Instagramwww.kvalentine.com Check out new single “That’s Real” ft BJ the Chicago Kid via Youtube. Download “Here For A Reason” via ITunes NOW!!!! This episode of XKLRADIO features Fiend “Mr International Jones”, whose a hip hop industry legend. Follow @504Fiend via Instagram/Twitter. Check out latest project “1st Rolex” OUT NOW!! This episode of XKLRADIO features “Brandon Johnson’ the Chicago Teachers’ Union Political Officer, talking about career,Chicago Publc Schools, Politics, Being a Parent, Hip Hop, and more. This episode of XKLRadio features “Mark Wallace”, who heads the “Citizens to Abolish Redlight Cams” in Chicago. Wallace discussed about the organization, and progress against red light cams, real estate, politics and more. This Episode of XKLRadio features Chicago Radio Legend “AL Greer” sharing stories about the Music Industry, Radio Industry, and more. Listen to AL Greer each week Live on WOSD.com. Follow @peanutbuttabrotha1 IG/Twitter. TEK of Smif n Wessun call-in to XKLRadio talking about new music launching on New App “Parallelz”, also being in-studio with 2pac, being best friends with B.I.G, being positive and more!!! Live on XKLRadio WIIT 88.9fm Hosted by DJ Pat XKLusive and Dometi the Prophecy. This episode of XKLRadio features Houston Rapper “SUN” in town promoting new music and working in studio with Saint the Good Boy. Also, Chicago Violinist “Windy Indy” comes through with crew for mini-concert, and more. Follow @sun_days @windy_indy. his episode of XKLradio Radio features “YdotGdot” Chicago’s Favorite Nerd, talking about his experiences and dropping his new album “Its About Time”. Follow @YdotGdot via IG New music on SoundCloud. DJ Pat XKLusive caught up with NBC’s The Carmichaels’ & Comedian,”Lil Rel, giving comics advice, after a recent Live standup concert in Chicago. Make sure to watch the NBCs The Carmichaels every Sunday 9/8c. Live Interview w/ D Woods talking moving on from Danity Kane, New Music, recent movie role, and more. Follow @YaGirlDwoods on Twiiter/Instagram. Check out her latest single “Keep Calm Dance to This” on Youtube. Live Interview w/ Film Director Will Gates talking about Film career, hip hop stories, directing Netflix Hit “Narcos”, and more!! Live in studio on XKLRadio WIIT 88.9fm. Live Interview w/ The Legendary “Geto Boyz” after their Chicago concert on their recent 2015 tour. Live w/ Former Oxygen’s Bad Girls Club Aysia Garza talking about being on Reality TV, working on New Online Boutique and more.